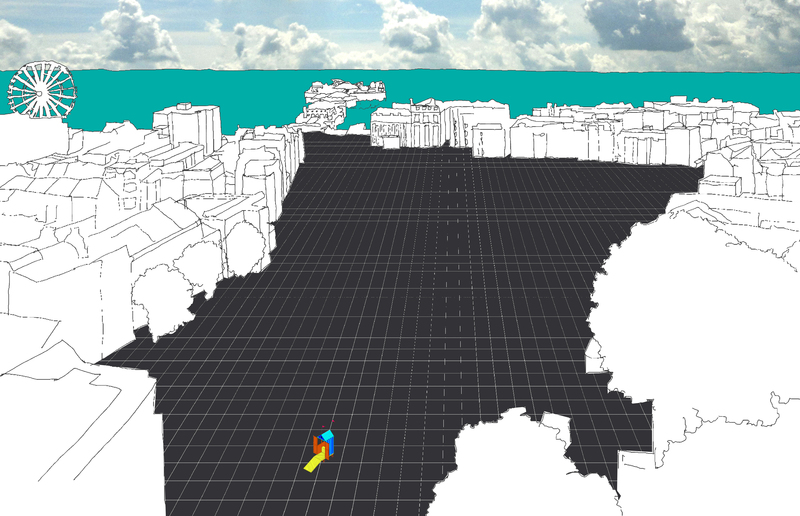 On June 13th 10 speakers, 5 invited audience members (as well as an actual audience), 2 student coordinators and I convened at the University of Brighton’s Grand Parade campus in the centre of the city for a symposium I’d organised called Tangible and intangible Commons. I’ve already written about the build-up to it here. Several months have passed since the event itself and it has taken that long for some of the ideas we discussed to begin to re-emerge in my thinking, in my work and in my teaching. Ideas of ‘commons’ and processes of ‘commoning’ have in recent years attracted increasing academic but also community attention. And although I wanted this symposium to be part of this commons ‘trajectory’, I also wanted to begin to bridge what has become, it seems to me, a separation between what I came to term the ‘tangible’ and the ‘intangible’ in commons research – and to situate this potential ‘common ground’ in Brighton’s Valley Gardens. Conversations have shifted in recent years from straightforward, though fascinating, notions of physical commons to encompass much broader ideas of common and co-operative ownership, rights, and hierarchies of power. Common land has been the subject of much research in recent years, but less has been done on the specific relationship of urban centres to common, ex-common or common-like land. Bowden, Brown and Smith’s An Archaeology of Town Commons in England is the one notable exception. With the Newcastle University Humanities Research Institute (NUHRI) I am in the process of bidding for a 3-year AHRC research grant to investigate the past, present and future of those places and relationships and so it was important to me that we probed this area at least a little. Once part of vast tracts of manorial wastes (a medieval form of common land) the remaining fragments now known as Valley Gardens have been, and continue to be, the subject of initiatives to ‘improve’ them. I wanted the symposium to situate these vital, yet nevertheless somewhat parochial, concerns in the wider debate about what the ‘commons’ mean; to ask what might a more radical re-commoning of Valley Gardens signify – even look like. Excellently chaired by Leila Dawney, this session hinged on Elona and Xavi’s timely reminder that commoning as a term, and as an idea, already had a venerable history and that this perhaps intangible set of concepts had very tangible products, promoting “non-competitive and solidary forms of living, friendship and care, and self-organisation of Common Pool Resources”. All of this echoed nicely the position of Robert Mull in his paper, that the space of the refugee camp is civic, that is, space with commoning tendencies. Our symposium venue, at the university’s Grand Parade campus, faced on to Valley Gardens and Jim Mayor’s presentation quickly grounded us in that physical space directly outside the building we were meeting in, reminding us of its immediacy, its vitality and of its conflicted history. This shorter session twinned Janice Astbury’s assertion that “the urban commons should offer a dwelling place, a meeting place and a space for co-creation that benefits all—humans and non-humans” with the landscape architect for Valley Gardens, Fenella Griffin’s, reminder that “today both ‘valley’ and ‘gardens’ have become virtually lost to the reading, resulting in a residual and damaged landscape, which registers few of its former attributes as either undeveloped marshy commons or gentrified promenade”. For Janice and Fenella these non-human attributes, if ignored, damage the urban common for non-human and human alike. But the tone was practical and laced with hopeful precedent. This somewhat unusual and participatory session began with Leila Dawney introducing her recent books on and around the subjects of commoning and the commons; Space, Power & the Commons and Problems of Hope. This was followed by a general invitation to all at the symposium to take lunch on Valley Gardens and, if they were so minded, to record sound and video, and to upload it to the symposium website. This material was reviewed during a panel immediately following that lunch. In that panel featuring me, Emma Cheatle, Xavier and Elona, we attempted to interpret and unpick the ’findings’, following possible narratives through the subtle, the overlooked and the traces of the ephemeral. The technology was a little clunky and this was perhaps off-putting for some – and some images appeared only after the panel had begun. This has led to the pleasant surprise of finding new images from the event – inviting new interpretations and speculations – months later. In a speculative and propositional analysis of “Brighton’s most significant public space”, Valley Gardens, Graham Perring, began the final session of the day by presenting his students’ architectural work, bringing “evidence [of] the value of urban common land, far beyond its mere physical state, in allowing for (re)production of public space in the contemporary city”. Graham’s creative response to Valley Gardens stood well against David Bell’s paper on the use of historical and critical art practice methods at ‘The Island’ in Nottingham, revealing and dissecting as it did the political drivers in the use and abuse of common urban space. The ‘common’, in this reading, was cast, as David put it, as “an ‘everyday’ commons; [speculating] forwards to show how well-intentioned artistic practice and naive celebrations of the commons risk boosting capital whilst alienating artists and commoners from their labour; and displacing the poor and vulnerable”. In her overview of our Newcastle University / University of Brighton commons collaboration, Emma gave us a wide-ranging view of urban commons in their more physical and historical guise, their “history […] of contestation and negotiation around wealth, class and philosophy”. Her articulation of the desire to “re-evaluate its future as a culturally valuable, publicly accountable space in English cities” resonated deeply with David’s “everyday commons”. The residues of the symposium have led me to re-examine and radically reconstruct my early interests in the subject of seventeenth century common land in the light of twenty-first-century commoning imperatives. And are being recast as specifically architectural concerns. The drive to build on the commons is ancient, and those buildings have always been marginal in their location, the structures on common land contested as well ambiguous in their quality; good enough to call home, disposable enough so that their passing is without regret. I wonder how histories and theories of common land might cultivate new approaches for their use, processes of heritage and systems of governance. Elinor Ostrom, Governing the Commons: The Evolution of Institutions for Collective Action (Cambridge: Cambridge University Press, 1990); Peter Linebaugh, Stop, Thief! : The Commons, Enclosures, and Resistance (Oakland, CA: PM Press, 2014); Guido Ruivenkamp and Andy Hilton, eds., Perspectives on Commoning: Autonomist Principles and Practices (London: Zed Books, 2017). Mark Bowden, Graham Brown, and Nicky Smith, An Archaeology of Town Commons in England: ‘A Very Fair Field Indeed’ (Swindon: English Heritage, 2009). Brighton and Hove City Council, “Valley Gardens: Public Realm Analysis,” (Brighton: Brighton and Hove City Council, 2011). Elona Hoover and Xavier Balaguer Rasillo, “Intangible Commons as Tangible Commoning: The Materiality of Making [Abstract],” in Tangible and Intangible Commons [Website], ed. Alessandro Zambelli (Brighton: University of Brighton, 2017 (accessed 22.10.17)). Robert Mull, ““Commons and the Camps”: Civic Space in the Current European Refugee Crises [Abstract],” ibid. Jim Mayor, “Valley Gardens Context Past, Present and Future – How the Evolution of a Commons Has Echoed the Changing Aspirations of a City [Abstract],” ibid. Janice Astbury, “Co-Creating a New Urban Commons [Abstract],” ibid. Fenella Griffin, “Common Ground / Common Good – a Case for Valley Gardens [Abstract],” ibid. Leila Dawney, Samuel Kirwan, and Julian Brigstocke, Space, Power and the Commons: The Struggle for Alternative Futures (London: Routledge, 2016). Leila Dawney, Claire Blencowe, and Patrick Bresnihan, eds., Problems of Hope (Lewes: ARN Press, 2017). Graham Perring, “(Re)Public Brighton [Abstract],” in Tangible and Intangible Commons [Website], ed. Alessandro Zambelli (Brighton: University of Brighton, 2017 (accessed 22.10.17)). David M. Bell, “‘The Island’: Creativity, Capital and Commons in the Contemporary City [Abstract],” ibid.